If I had to pick the one country that most consistently built cars that interest me, I think I’d have to say Brazil. The peculiar nature of the Brazilian economy for many decades coupled with what seems to be a fearless, creative approach to car design has managed to produce so many fascinating things. Like these Ford trucks—the F-1000 series. Welcome to a whole new perspective on Ford trucking, one that will make you feel like you stepped into a parallel universe. The F-1000 series was built between 1979 and 1998, and if you look carefully—or even carelessly—you can see that the trucks are based on the fifth-generation Ford F-series trucks, built between 1967-1972 in the U.S.A. I haven’t got complete proof, but I believe the tooling for this series of trucks was sent to Ford’s subsidiaries in Brazil after they were succeeded by the sixth-gen F-series trucks here. In 1986, a major facelift took place which essentially grafted the rectilinear ‘80s aesthetic onto the more curvy and ornate ‘60s design language that the truck was designed with, and the results are pretty bizarre. The dichotomy of the old and new visuals is probably best seen in the 1991 F-1000 Turbo, Which combines that iconic ‘60s Ford truck look with a late ‘80s/early ‘90s front face and TURBO graphics that look like they use the same font used on the credits of Star Trek: The Next Generation. Everything about it looks confusing and wrong and I adore it. Plus, this was the first turbo-diesel engine for the Brazilian F-1000 series, and made a respectable 119 horsepower. But what excites me the most about these Brazilian F-1000s are the variants built by a company called Sulamericana. Sulamericana was an authorized Ford coachbuilder, and would receive “0-mile” (the original source says ‘0 km’ but I did the math and that roughly equals zero miles) trucks to modify, complete with warranty. The company made military vehicles, ambulances, and other utility vehicles on a wide variety of platforms from multiple manufacturers, but I just want to focus on a few F-1000 variants they built. Look at that thing! It’s like the gigantic grandfather of a Suzuki X-90! It’s a Ford F-series two-door sports coupe, somehow. It sort of makes no sense that it’s just a two-door, but that’s also part of the charm. Were these sort of an alternative to a regular family car for people who lived in rural areas with rougher roads? A classy alternative to a pickup? I’m not really certain, but I’m smitten. Holy crap, right? Look at this glorious thing! Going from front to back, we start with F-1000 pickup truck, then somehow morph into a conversion van, then slip back into pickup truck at the end. Is there anything this thing couldn’t do? Van roominess, a truck bed, high, rugged stance, oh man, I love it. The sheer number of variations Sulamericana came up with for this basic Ford pickup are absolutely astounding. There were pickups and SUVs and huge sedan-like things and vans, and variations on all those, with names like Airplane, Buffalo, Mirage, Guerrero, and Caravelle. I especially like the use of doubling-up the standard ‘70s Ford truck/van taillights on that Caravelle on the far right. In the modern American market, flexible, multi-use vehicles like this haven’t been too successful, if we count things like the Honda Element or the Chevy Avalanche in this category. Maybe it’s because they didn’t go far enough, and needed to push things to full GB Special Fly levels? 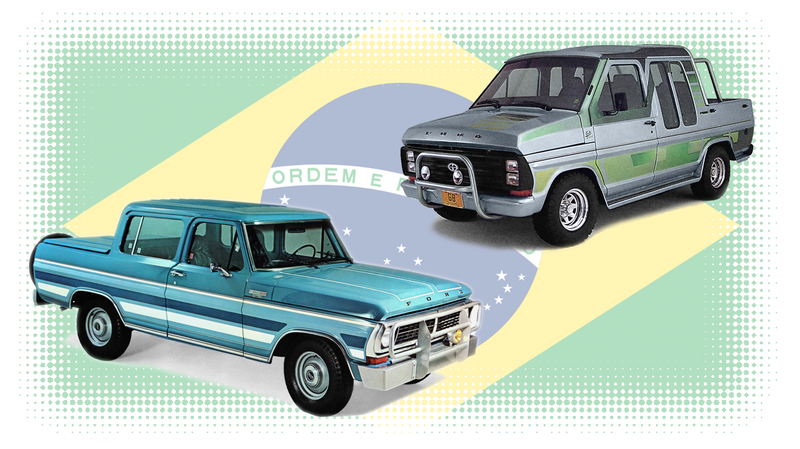 The ability of the Brazilian market to embrace such wild variety—and bold stripe kits—is a quality I wish was more present in the car market of today. Now if you’ll excuse me, I’m going to obsessively search Mercado Livre for Sulamericanas. Especially a Special Fly.